Eliminates oily dandruff, normalizes sebum secretion and purifies oily scalp. Even healthy scalps shed skin cells, but it is the acceleration of this process - linked to an excessive presence of the Malessezia or similar fungus on the scalp - which causes dandruff. 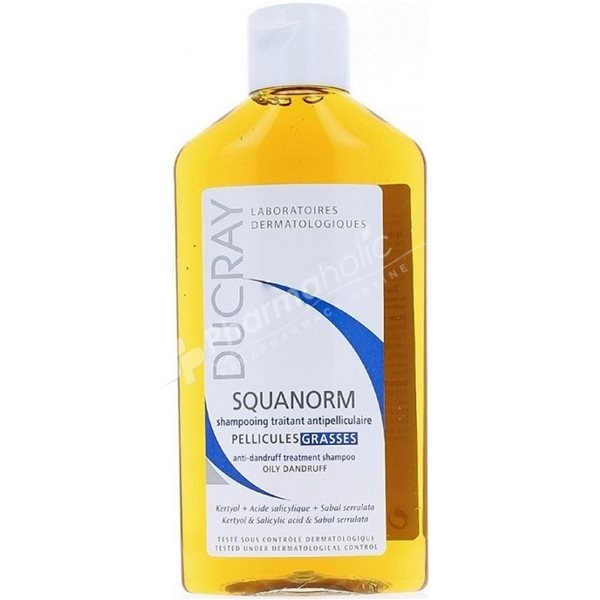 The anti oily dandruff treatment shampoo Squanorm by Ducray longlastingly eliminates oily dandruff, normalizes sebum secretion and purifies oily scalp. Kerytol allows soothing quickly itching and redness with a lasting effect. Salicic Acid helps remove greasy dandruff, and the extract of Sabal Serrulata has an anti-seborrhoea action. Combined with a cleansing oxygenating base, it allows cleansing hair perfectly. Use twice a week for at least 6 weeks. At application, leave on to take effect for 3 minutes and rinse. Avoid contact with eyes or damaged skin.